Kate Middleton walked into Westminster Abbey this morning a commoner and emerged with an HRH title, but that's only the start of her amazing transformation. From this day forward, her life will never be the same. I was struck by Catherine's incredible poise. From what we saw this morning, the bride (who chose the perfect McQueen dress said to be inspired by her admiration for Grace Kelly's wedding dress) is more than up for the job as the royal family's newest star. She acted and looked as if she was born to the royal life (and, I must say, at certain points seemed much more comfortable than William). When I started covering the engagement and in the run up to the wedding I wrote that I did not find her fascinating. All that changed this morning. 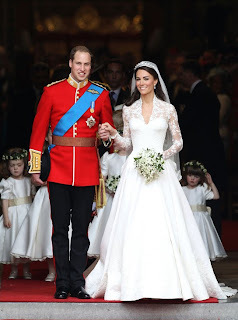 'Waity Katy' no more, Catherine (she can no longer even be thought of as 'Kate') looked so serenely happy and firmly in control as she confidently look her father's hand and glided down the aisle of Westminster Abbey. She appears to be neither skittish nor addicted to the limelight. Catherine is just one of those rare public figures who is simply is made for the spotlight. It has transformed her but she has not lost her naturalness that makes her so charming. She is simultaneously able to appear regal and 'regular' as when the couple appeared on the balcony of Buckingham Palace and she appeared to have said, 'Oh wow!' when Prince William gestured to the huge crowd that had gathered before them. It's quite clear that William adores her and she him. That alone -- the added confidence she has from knowing that he married her for love, not duty, will make all the difference in how the next chapter of their lives unfolds. And what of Catherine's family? I have to say I was quite impressed with the entire Middleton family. Pippa (who also looked stunning in Alexander McQueen) performed her duties as Catherine's maid of honor flawlessly and was quite charming with her young charges. It would be wise for Catherine to have Pippa as her lady in waiting so as to have a true friend and sister in such an important position will be another key element in ensuring Catherine's success in her role as Princess Royal. Her parents completely melted my heart. For whatever is or isn't true about Carole being the driving force behind the family's ascension into the social stratosphere, she struck exactly the right tone in her behavior and appearance. I believe she chose her classic Catherine Walker coat dress as a touching tribute to Diana who almost always wore a similar look whenever she attended a wedding or official royal function. Just lovely. Michael Middleton looked and acted like the absolute perfect father of the bride. He was clearly proud but charmingly a tad nervous as evidenced by his gesture of wiping his brow as father and daughter finally made it to the altar. He's held himself with great dignity throughout this entire pre-wedding episode and when I look at him, I see a kind, thoughtful man. Phillipa Gregory, appearing on the Today show with Meredith Vieira sounded the only discordant note of the day saying she "wasn't optimistic" about Catherine's future and speculating that her parents would quickly be "iced" out of Catherine's life by the royal family. I think she is greatly underestimating Catherine -- and William, too. It is rare to watch history unfold before your eyes and at the same time get a glimpse of what is to come. I felt that when I saw the newlyweds sitting on the altar and when Catherine flawlessly curtsied to the Queen before she walked out of the Abbey to greet the throngs of people awaiting a glimpse of their future queen. Now all of England (save the Queen) must curtsy to Catherine as an HRH. As a royal, she received the title of Duchess of Cambridge. Whether she will be known formally as Princess William of Wales(which was bestowed upon her automatically -- she is not officially Princess Catherine because she is not of royal blood)remains to be seen, but one thing is clear. She is the royal family's newest and most important star and that's a currency that I believe she will use wisely. Catherine was unbelievably calm. She has handled the whole thing so well.